The eighth edition of the 2018 ASBU BroadcastPro Summit and Awards culminated with a gala dinner and awards ceremony on 13 November at Dubai’s Habtoor Grand Hotel where excellence in production, VFX, satellite and broadcast services, systems integration and OTT initiatives, among other categories, were recognised. The ASBU BroadcastPro Summit & Awards has served the broadcast industry in multiple ways by bringing together industry experts to not just share their knowledge and experience but also connecting individuals and businesses together. The MENA-wide panel of judges had more than 130 nominations to sift through to select the contenders that made the shortlist and then declared eventual winners. 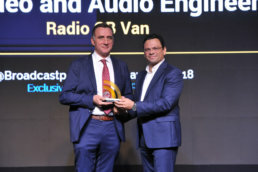 For Outstanding Innovation in OB Engineering, ARET Video and Audio Engineering was recognized for creating a totally brand new concept of Radio OB Van, that makes it the first of its kind in this category of vehicles. In the photo on the right, VP of International Sales Umberto Asti, receives the award during the gala dinner. The BroadcastPro Summit and Awards was organised by CPI Trade Media and endorsed by the Arab States Broadcasting Union (ASBU). The event was sponsored by gold sponsor Akamai; social media partner Twitter; associate sponsor Fox Networks Group; knowledge partner Irdeto; silver sponsors, Lawo, Eutelsat, 7 production, ZEE Entertainment Middle East and UTURN; and our networking sponsor Shock Middle East.